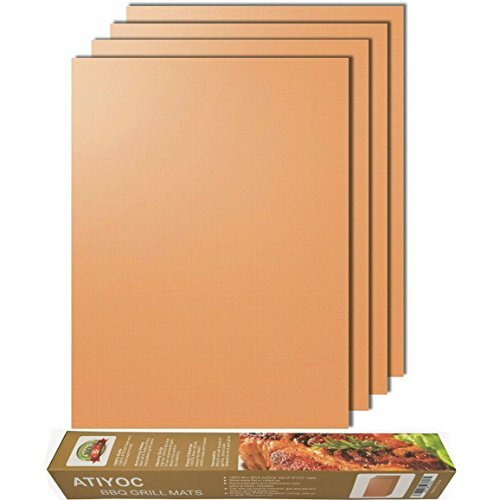 Set of 4 Mats,15.75" x 13"
KEEP FLAVORS: These non-stick mat will keep the food nutrition and original flavors. It will prevent flare ups caused from dripped grease that cause your meat to become charred and dry, and ruin your meal. Instead, meats will hold their juices and still get grill marks.Everyone could be a super grill-master with these magic mats. LESS JOB: No more mess up on your grill. No more scrubbing job need to be done. Simply remove your grilling mat once cool down and wipe it with a soft damp cloth. It's dishwasher safe, hand washable and very easy to clean up. NO SAFETY ISSUES: These BBQ grill mats are made from 100% PFOA-Free materials and premium PTFE-Fiberglass coating (thin for better heating), no PFOA, silicone or other dangerous chemicals! Certified as safe by the FDA approved. EASY TO STORE: You could easily store these mats flat or rolled up after using it. It will save abundant space compared with your grill trays. These mats are reusable and durable. With proper care, the mats will last for years to come! WHAT YOU GET: Set of 4 copper grill mats. Our fan-favorite 18-month warranty and friendly customer service. If any help we can do, please feel free to contact us. If you have any questions about this product by Atiyoc, contact us by completing and submitting the form below. If you are looking for a specif part number, please include it with your message.